Majespecters, Super Cool Animal Deck! You are here: Home / Majespecters, Super Cool Animal Deck! If you’re as bored as I am with the current metagame, then this is surely the article for you! After what seems like an eternity, there is finally a set release that is bound to spice things up before the inevitable world is turned upside down with BOSH’s release. In the wake of BOSH’s impending storm, lets enjoy the calm before the storm and delve into one of my new favorite decks, Majespecters! Majespecters are a deck that is a culmination of a variety of different animals that all have special effects. Majespecters are also a Pendulum deck, which means they can overwhelm their opponent very quickly if not dealt with. Lets meet the new lovable animals shall we! Every single Majespecter monster has the special effect, which prevents them from being targeted or destroyed by your opponent’s card effects. The go-to Majespecter monster, Raccoon, allows you to search your deck for any Majespecter monster when he’s normal summoned or special summoned. Basically, Raccoon is the Stratos of the deck despite almost every other Majespecter monster being able to search too. Yes that’s right, nearly every monster in the deck is a Stratos, but they all search different cards. Majespecter Fox is my second favorite one because when he’s normal or special summoned, he allows you to grab any of the Majespecter trap cards in your deck and add one of them to your hand. Aren’t trap cards kind of bad in a super fast metagame? Generally speaking I would agree with that, but Majespecters actually get to use the power of Solemn Notice before anyone else can. Yes, Majespecters can search Majespecter Tempest, which allows you to negate the special summon of a monster(s) or negate the activation of a monster’s effect and destroy the respective card(s). This powerful effect is possible by simply tributing one WIND Spellcaster type monster from your field and voila you can effectively use Solemn Notice before anyone else! The other Majespecter trap card available to you once Dimensions of Chaos is released (DOCS), is Majespecter Tornado. Tornado has a rather simply, but powerful effect because allows you to banish any monster your opponent controls! Why yes, by simply tributing one of your Majespecter monsters you can banish any monster your opponent controls! It’s important to note that this effect does target, which means it won’t deal with things like Forerunner or the new big papi Dark Destroyer. “Hey, what about the other animals?” Oh yes, the next Majespecter monster I’d like to go over is Crow! Majespecter Crow has the general Majespecter effects of being immune to targeting and destruction effects, as well as his ability to search for any of the Majespecter spell cards. I’ll start with my more preferred spell in the deck, Cyclone. Majespecter Cyclone is a quick-play spell that allows you to tribute one of your Majespecters to destroy one of your opponent’s monsters. One of the main reasons I really like this spell over the other one is the fact that Cyclone is reactive and can be used to make certain cards miss timing. For example, if you already have Majespecter Cyclone in hand, and summon any of your Stratos monsters and activate their effect(s), you can then activate Majespecter Cyclone on chain link 2 to destroy a Yang Zing monster and make it miss timing (It won’t float). The current alternative that will be available in DOCS is Majespecter Storm, which has quite the effect! While Majespecter Storm is not chainable, it can prove to be stronger than Cyclone in various situations. Majespecter Storm allows you to tribute any of your on field Majespecters to shuffle one monster your opponent controls back into the deck. Shuffling things like Deneb, Sliprider, Yang Zings, Dante, or even a Nekroz monster can prove to be quite valuable in this deck. The next spell card, which is NOT searchable via Crow, is Majesty’s Pegasus. Thank god this card is not searchable off of Crow because otherwise this deck would be a much bigger threat. Majesty’s Pegasus is the Majespecter Field Spell, which allows the deck to generate advantage very fast and take control of the game if it sits on the field for too long. 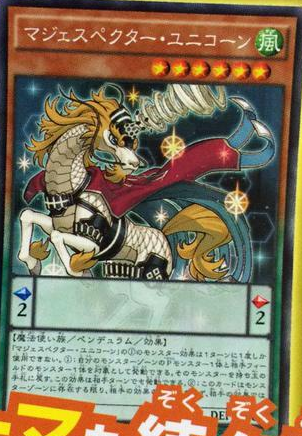 Majesty’s Pegasus has two effects that are both very beneficial to the deck. The first effect increases the ATK/DEF of all Majespecter monsters on the field by 300, which is important because all the monsters have low attack strength. The second effect is by far the more powerful one as it allows you to tribute 1 Wind Spellcaster type monster (any Majespecter), and then special summon one level 4 or lower Majespecter monster from your deck! Remember that anytime the Majespecter monsters are summoned they get to search for their respective target. The field spell is what puts the deck ahead of others in stalemates and can really be the defining factor in winning the game. For the preceding reasons I would play one/two copies of terraforming to ensure access to this powerful field spell. The next Majespecter monster is Cat. Why yes, you can play a little kitty cat in your deck and it’s actually quite good! Cat is the only searcher in the deck that can grab ANY Majespecter card, but only during the end phase of the turn it was summoned. At first look, Cat doesn’t seem to be great, but in combination with Majesty’s Pegasus or any of the Spells/Traps Cat shows its worth. Majespecter Cat does not have to be on the field during the end phase to resolve her search effect, which is why tributing her off for any of your spell/trap effects is key. Of course I saved the boss monster of the deck for last! Majespecter Unicorn is quite the powerhouse if properly supported in this deck. Unicorn is the only Majespecter monster that doesn’t search for something, but that’s actually just fine! Unicorn’s effect allows you to return any Pendulum monster on your side of the field to return any monster on your opponent’s field back to their hand. The best part about Unicorn is since your returning Pendulum monsters back, you can very easily just special summon them for free on the next turn. What Can This Deck Really Do? Majespecters are similar to Yang Zings in a sense that they take a bit to get going, but once their rolling they’re pretty hard to stop. The first thing you want to accomplish with Majespecters is to get a Cat or a Raccoon into play. Cat and Raccoon’s effects will help search the combo pieces you need to take control of the game. It’s important to note that Raccoon can search himself, which means that if you only have Raccoon in your hand, you always want to just grab another copy of himself because you want to ensure you have a play for your next turn. Raccoon and Cat are just the beginning; once you manage to set up your Pendulum Scales, you can start gaining huge amounts of advantage. This advantage comes from a reoccurring Pendulum summons on your turn that will search 1-4 Majespecter cards from your animal’s effects! Hmm, lots of monsters coming out every turn, but it doesn’t seem like they’re doing anything big. Unlike Qliphort monsters, Majespecters don’t have a lot of attack points, which means they must rely on their spells and traps to keep them in the game until they gain access to Luster Pendulum, the Dracoslayer (LP). LP is extremely powerful in Majespecters as both of his effects are instrumental in winning the game. LP’s pendulum effect helps you thin your deck and help cement your pendulum scales. Using LP as a tuner is by far more powerful because if you have at least 2 level four non-tuner Pendulum monsters on the field (Crow/Fox) you can deal your opponent 6550 damage if you can clear their field. Lets delve into this very simple, but powerful combo! Before I explain the combo I’m going to briefly tell you what two important cards in the combo do to avoid any sort of confusion. The first card I haven’t mentioned in the article yet is Ignister Prominence, the Blasting Dracoslayer. When this card is Xyz Summoned: You can activate this effect; during the End Phase of this turn, add 1 Pendulum Monster from your Deck to your hand. Once per turn: You can detach 1 Xyz Material from this card; Special Summon 1 face-up "Dracoslayer" Pendulum Monster from your Extra Deck, but it cannot be used as Material for an Xyz Summon. Requirements: 1 Luster Pendulum the Dracoslayer, 2 level four non-tuner Pendulum Monsters (In Majespecters that will be Crow/Fox until Toad is released). Step 1: Synchro summon for Ignister Prominence using Luster Pendulum and any of the level four pendulum monsters. Step 2: Use Ignister’s second effect to special summon another LP from your deck in defense position. Step 4: Use Majester Paladin’s effect to special summon the LP from your extra deck that you used to synchro into the Ignister with. Step 5: Push for 6550 damage (1850+1850+2850) And if you don’t win that turn you get to add any Pendulum monster from your deck to your hand during the end phase thanks to Majester Paladin’s other effect. Majespecters are something super fun to play, but I don’t think they will fair very well on a grand stage. The deck is far too slow and requires very good hands to compete with the likes of Nekroz and Kozmo, but the deck can most certainly hold its own against Burning Abyss and other popular decks. If you’d like to see a deck profile with explanations next week, feel free to give me some indication that you are interested! If you have any other ideas you would like me to write about, shoot my message on Facebook or comment on the article so I know what you guys want me to write about! Until next time duelists, Play Hard or Go Home! finally MJs wound-up in your region. i’ve been playing MJs since their release here in OCGLand, and they can give the Performapals/mages a good match up. Once you got the Fusion Dracoslayer, they can be quite indestructible as well.